Got, got, got…..NEED! Yes, this week we take another look at stickers and collectibles in the 1990s – a golden era for collectors! Ash Rose is joined by regular Joel Young and author of ‘Stuck On You’ Greg Lansdowne, ahead of this ITV4 documentary of the same name airing next week. The boys chat through the early 90s days of Panini, the rise of Merlin and their Premier League collections plus Pro Set, Pro Match, Orbis, Upper Deck and loads loads more. There’s also an interview with former Man City and Sunderland goalie Tony Coton. Stick with us and don’t be swapping for any other 90s podcast….and of course Keep it 90s! 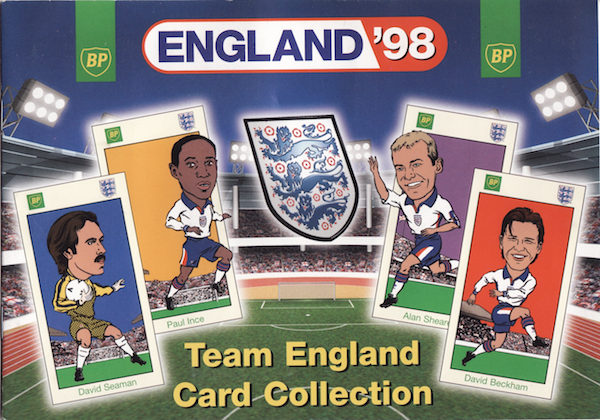 The 1990s was a peak time for sticker albums and collectables. 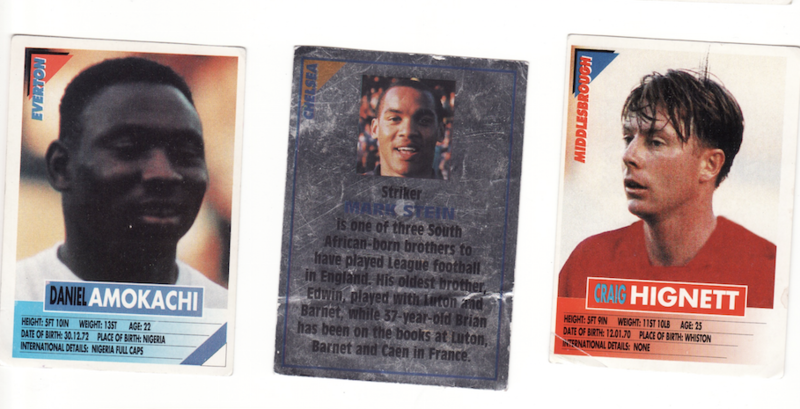 What with the emergence of Merlin and their famous Premier League collection, as well as memorable football series’ from Upper Deck, Pro Set and Pro Match – all of which we discussed on this weeks podcast. Yet there were a few collections that we didn’t get round to mentioning that went slightly under the radar, well unless you lived in my house. So here are six 90s collectables that you may gave forgotten about, and have remained firming ‘stuck’ in the 1990s. 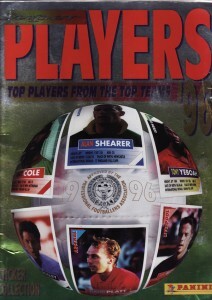 When Merlin’s Premier League collection was released in 1994, it began a period of dominance for the company not seen in the sticker world since the mid-eighties. Their shiny new collection had left former industry leaders Panini firmly in the shade, but to their credit the Italian rooted company did try and bite back. 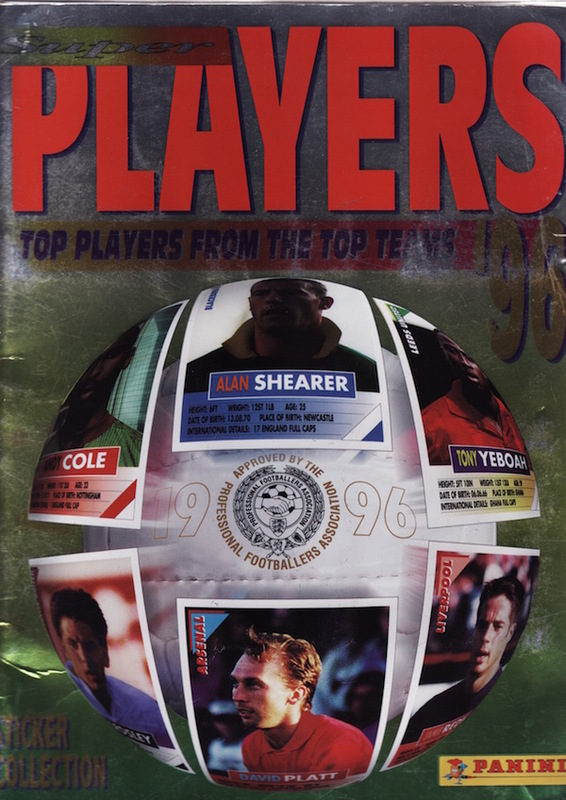 With a licence from the PFA still firmly in their camp, they released a collection in 1995 called ‘Players’ to try and take on Merlin’s Premier League giant head-to-head. Unfortunately the collection just wasn’t as glamorous as it’s counterpart and without the official Premier League licence, stickers were reduced to Wayne’s World style extreme close-ups with fake kits or players in random zip-up white jackets for the 95 album. Nice try Panini, but the playground only had one favourite at this moment in time. 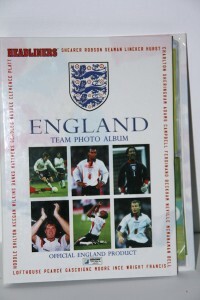 More football fun from a petrol station came in the guise of BP’s Team England Card Collection. Based on the classic cigarette cards of the 1960s, you were given these illustrated collectables whenever you spent over £10 in a BP garage. They even provided a booklet for the cards to go in; unfortunately the sticking in was down to you and therefore it was vital to find the best, non-messy glue to keep your album looking top notch. While the caricatures varied differently in their likenesses to that Three Lions squad. 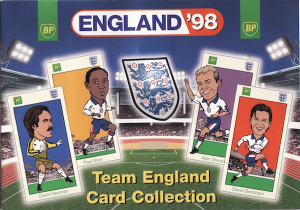 A World Cup 1998 collection that was a step away from the stickers or cards and onto something a little bigger – photos. 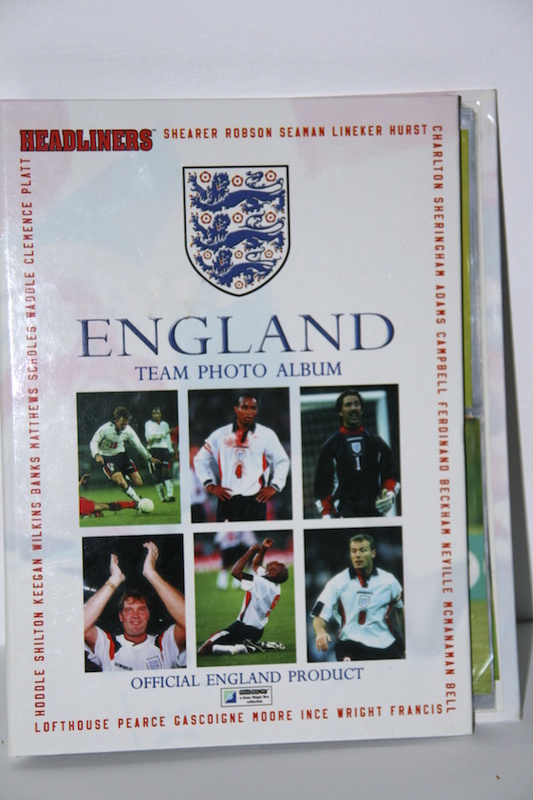 Featuring all the names from England’s 1998 squad, they came in squad shots, action poses and images from training. All were kept in a small binder that was much lighter and more compact than used in previous collections. Like a photo album you kept of your family and friends, only with potential World Cup winners instead. Can’t have been very popular, as it’s never ever been attempted again. 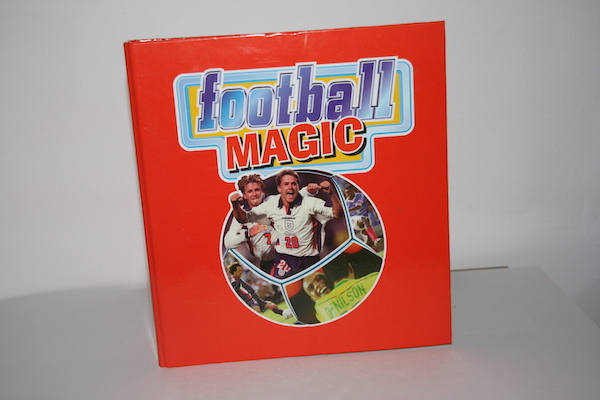 Right at the end of the decade a rare collection was released called Football Magic. No, it wasn’t a joint venture between Alex Ferguson and Paul Daniels, but a collectable series in the vein of Orbis’ version years before. Each week you’d fill your little red binder with new content for sections that included team guides, heroes from the past and football tips to the extent that the collection eventually spread over several binders. It however just disappeared mid-way through binder number three and was never seen again. Magic indeed. 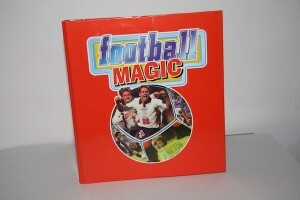 There aren’t many things more nineties than flick-books, remember those? Little books that when flicked through quickly merged each page together to create an moving image – who needs tablets, eh? 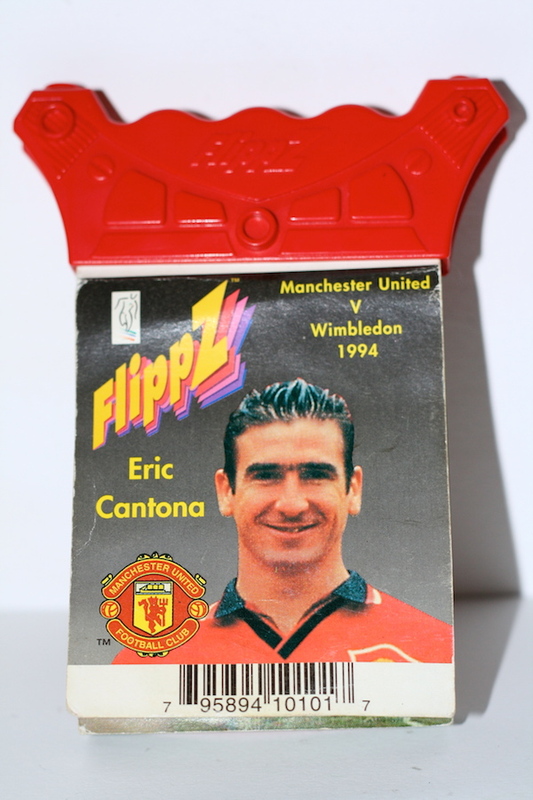 Well, there was of course a football version of this in the mid nineties called ‘Flippz’. Focussing on one player and some of their greatest goals, they were retold just by a flick of a finger. Technology felt like it would never get better than this. Thankfully, it did. A series of card collections from ‘Futera’ that was released at the back end of the 90s and oddly only focused on certain teams. Arsenal, Aston Villa, Celtic, Chelsea, Leeds, Liverpool, Manchester City, Manchester United and Newcastle all got the Futera treatment. Different collections included Masters, Sharpshooters, Fans Selections and a wrath of others from 1998 and 1999. 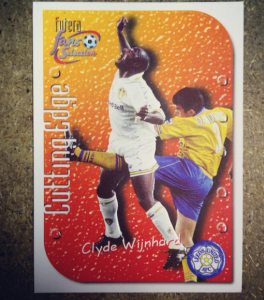 And yes the below card of Leeds was the unfortunate image used for Clive Wijnhard. Listen to us talk about the more famous collections of the 1990s on this weeks AK90s pod! We’re joined by author of ‘Stuck on You’ Greg Landsdowne, James Andrew from the Daily Mail and Trusted Reviews Michael Sawh. Or subscribe on iTunes HERE! Don’t forget to follow us on Twitter @AK90S. Ash Rose is joined in the studio by Sticker Man Greg Lansdowne, Fulham Fan James Andrews and Manchester United Fan Michael Sawh. The guys talk stickers, stickers and more stickers. We also have a great interview with former Newcastle and Coventry legend Micky Quinn!